Section 27 of the Finance Act, 2019 (No. 1 of 2019) introduced a new Standard Scale of Fines with effect from 20th February 2019, the date on which the Act was published in the Government Gazette and became law. The new standard scale is reflected in columns 1 and 2 of the table below. The new standard scale applies only to offences committed on or after the date it became law, i.e. on or after 20th February [see section 280 of the Criminal Law Code]. We have therefore included the previous standard scale in the table below as column 3. The previous standard scale will continue to apply to offences committed before 20th February and on or after the 23rd March 2017 [the date it was introduced by Act No. 2 of 2017]. 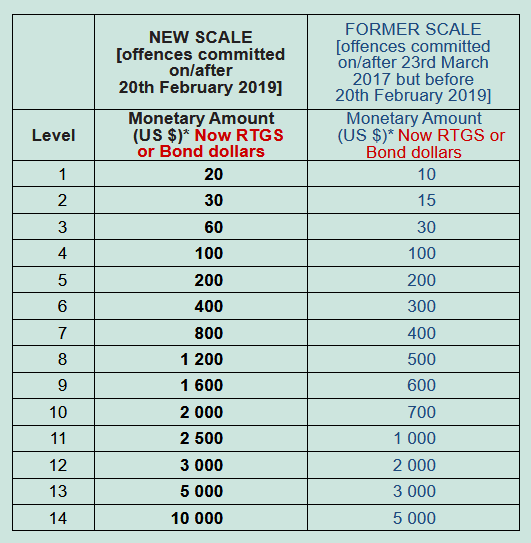 The effect of the new standard scale is that the maximum admission of guilt fine for a minor offence is now $60 [RTGS or bond] – the new level 3 – but this applies only to offences alleged to have been committed on or after 20th February 2019. For offences alleged to have been committed before 20th February 2019 and on or after 23rd March 2017, the maximum admission of guilt fine remains at $30 [RTGS or bond] – the previous level 3.